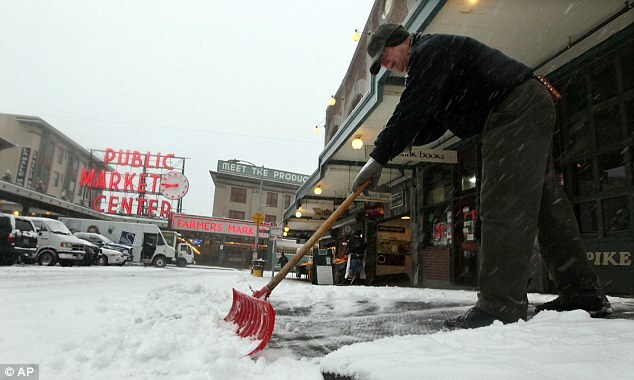 Around the unseasonable central states’ weather, the Pacific Northwest is receiving its own pummel of 100mph winds and near-record snowfall in some areas Wednesday stacking up to 16in. Sheltering from the winter weather in the north east, parts of Oregon have seen winds reach as high as 110mph, bringing much of the region to a standstill. 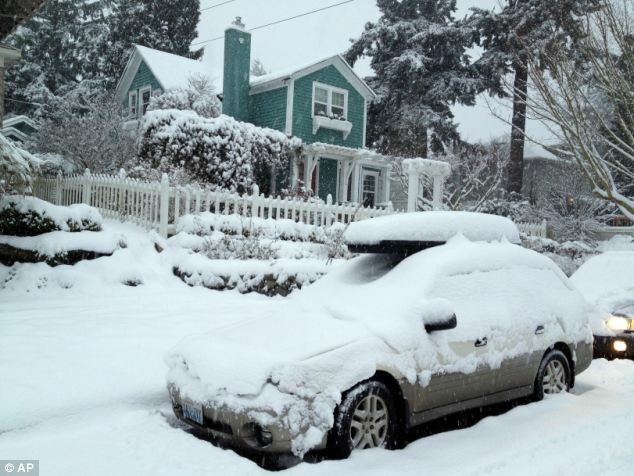 From the Washington state capital in Olympia to the Oregon coast, schools were closed, roads were clogged with snow and hundreds of accidents and dozens of flights were cancelled. In an eight-hour period near the capital, there were 95 accidents, mostly spin outs, according to a state trooper. 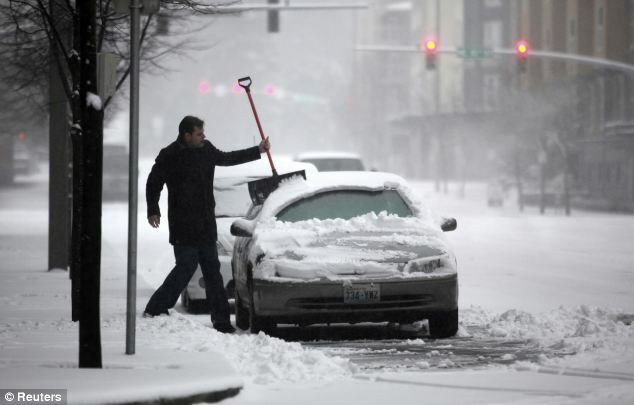 The storm, nicknamed ‘Snowmageddon’ as it approached the Puget Sound region, proved less extreme than originally forecast, with the National Weather Service lowering its outlook for possible snow accumulations from up to ten inches to around six inches, meteorologist Dustin Guy said. 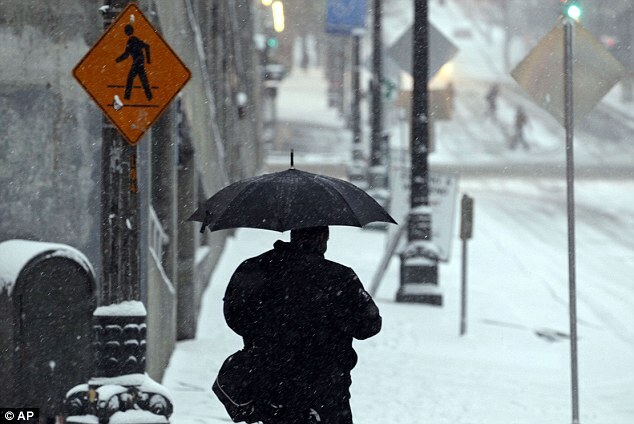 But warmer weather could lead to icy conditions, and Seattle officials urged people to find and clear street storm drains that could get clogged and cause severe flooding. Olympia had about a foot of new snow on the ground by 7.30am. 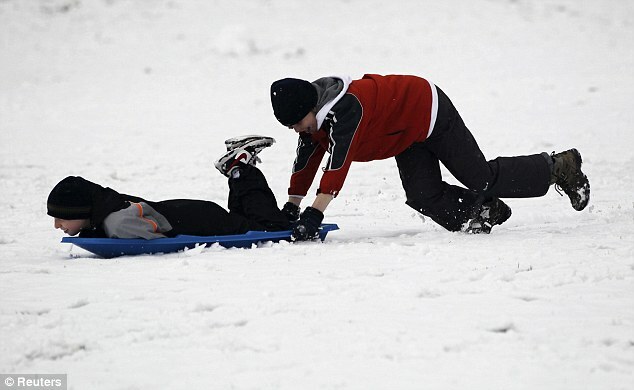 The city could break its record of 14in of snow in a 24-hour period, Mr Colman said. Areas south of Olympia could get 20in. ‘They’re getting hammered,’ Mr Colman said. 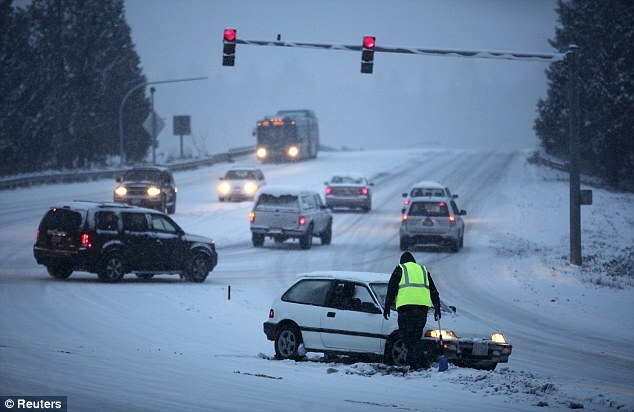 Tacoma had about seven inches of snow for the morning rush hour. 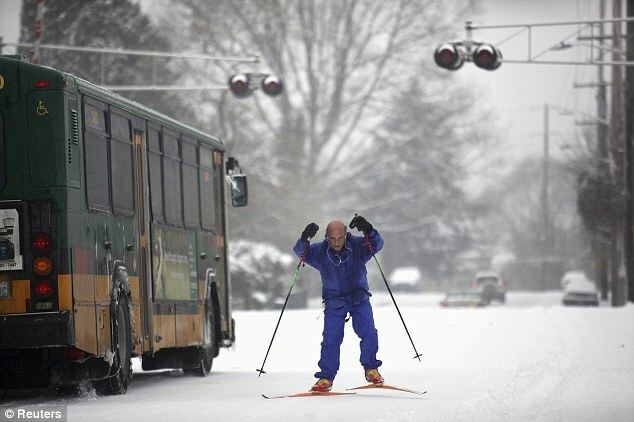 Seattle had compact snow and ice on roads for commuters. Lesser amounts were reported north of Seattle. High winds have begun hammering parts of the Oregon coast and causing power outages, with reports of gusts of 100mph and more. 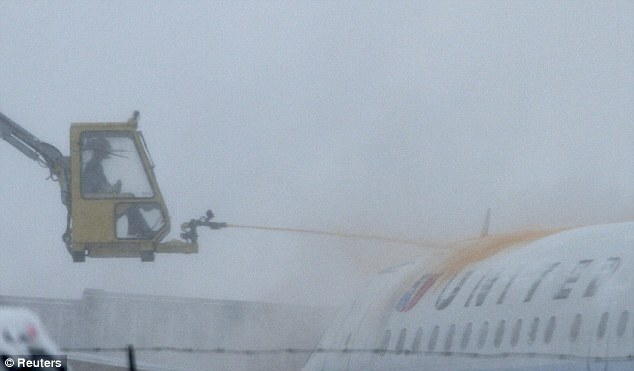 There were no immediate reports of serious damage. Heavy snow has been falling in Washington’s mountains with up to two feet of fresh snow expected by Thursday. Interstate 90 across Snoqualmie Pass was shut down for much of Tuesday for avalanche control work. 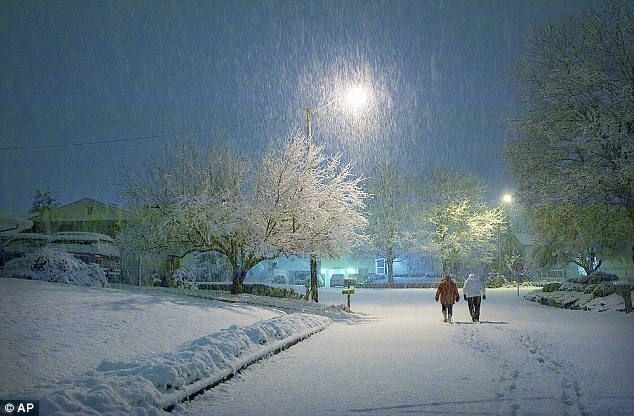 Washington residents had plenty of warning as snow showers started over the weekend. 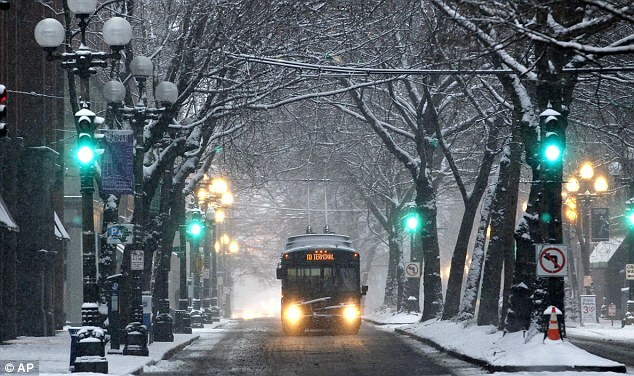 With the heavy snow in sight, Seattle and other school districts cancelled classes in advance. 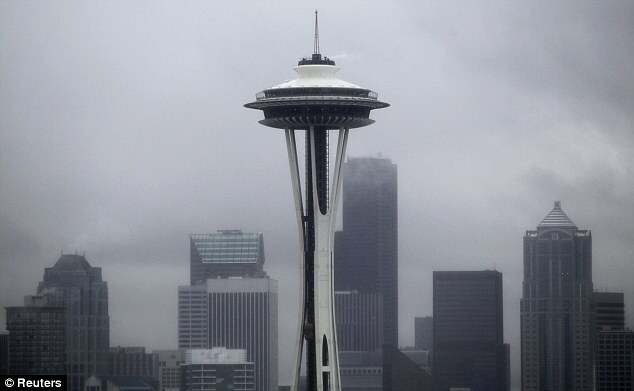 Alaska Airlines announced late Tuesday that it cancelled 38 flights into and out of Seattle and Portland, Oregon, Several downtown Seattle hotels reported all their rooms were booked. Elsewhere, shoppers stocked up on groceries. Many courts and government offices and libraries closed. Garbage collection was postponed. Senator Patty Murray cancelled her event at a Tacoma company where she planned to talk about employing veterans. Pat Hansen and her 17-year-old daughter, Emily, were taking photos of the growing piles of snow outside the Capitol in Olympia Wednesday morning. ‘I love it,’ said Emily Hansen, who had the day off because Olympia High School was closed, along with most other schools in the region. Her mom’s enthusiasm was more measured. ‘A day or two it’s fun, but after a while you start looking at accidents and slush and flooding,’ she said. It was business as usual at the Capitol, where committee hearings were still being held, if not fully attended. Some state employees drove into work, but others walked in, and at least one employee was seen cross-country skiing to the Capitol campus. The 60-day legislative session began on January 9. 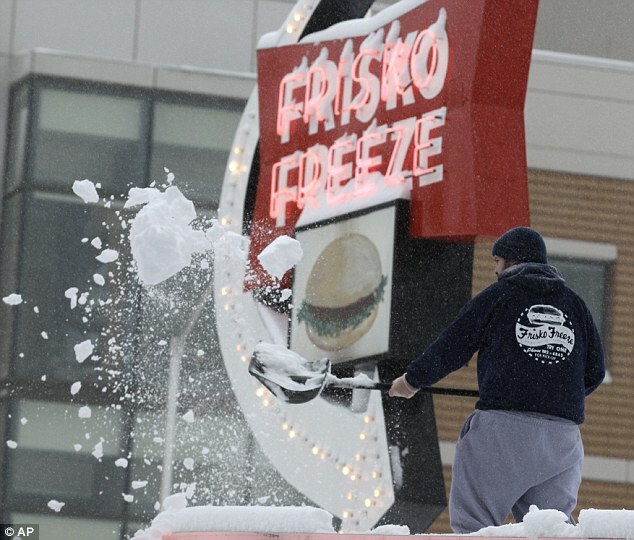 The governor could declare a state of emergency if conditions worsen, Reuters reports. Somebody essentially help to make critically articles I’d state. This is the very first time I frequented your website page and so far? I amazed with the research you made to create this actual post incredible. Excellent activity!